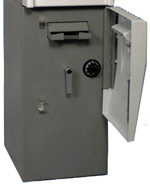 The wrg's® Genesis® ATM machine is what you have been waiting for - a reliable, contemporary ATM machine affordably priced! With WRG® customized C.A.S.S Software, and our newest CPU, the wrg® cpu, we are exceeding the standard in ATMs. Our Total Management Plan allows our business partners to concentrate on their establishment while enjoying an extremely low-maintenance ATM profit center managed by WRG Services. Optional features include an illuminated ATM top sign, electronic locks, level 1 safe, and many others to secure your investment. Multilingual support. Including English/Spanish, or English/French. Depth: 22" on floor base, 25" to front of plastic door.